CA Foundation Examination is a gateway to enter into the profession of Chartered Accountancy. As the name Foundation suggests, it is the Level -1 of CA entrance exams; the first of three hurdles that you need to cross to become a Chartered Accountant. CA Foundation exams are conducted twice a year in May and November. You can register for CA Foundation after clearing your 10+2 Board or an equivalent exam. If you are about to appear for CA Foundation May 2019, you must have already registered yourself before 31st December, 2018. Students who are converting from CPT to Foundation should register themselves on or before 28th February 2019. CA Foundation is an exam 400 marks and consists of 4 papers. Unlike CA CPT, CA Foundation will have both subjected and objective papers. Given below are the important dates pertaining to CA Foundation Exam Form 2019. Students may note that the last date for filling up CA Foundation exam form (with late fee) 19th March, 2019 (5:30 pm). There is no provision for filling up the CA application after that. Rs. 1500/- (For opting a Centre in India). Late Fee of INR 600/- for Centres in India and Kathmandu (US$10 for Overseas Centres) is applicable from 13th March, 2019 to 19th March, 2019. Step 1: Creation of Account - Visit the http://icaiexam.icai.org and do the one-time registration. Keep the following details handy: Registration no. , DOB, E-mail id and Phone No. The registration number and the password will be mailed to you on your registered id. Step 2: Proceed to application process. Click on the “Apply now” button. Step 3: Enter all your relevant personal details. After entering the details, scan for any error you may made in the entries. Once you are satisfied, click on “Save Details” and complete the registration process. Step 3: Submit your declaration by clicking on the “I Agree” button. Click on the “Back to Form” button in blue (down left-hand corner) to verify details. Click on the “Final Submit” button in green (down right-hand corner) to submit the application form, and proceed to make payment. Step 4: Proceed to the payment gateway to pay the exam fee. Refer to the table given above for more information on exam fees. 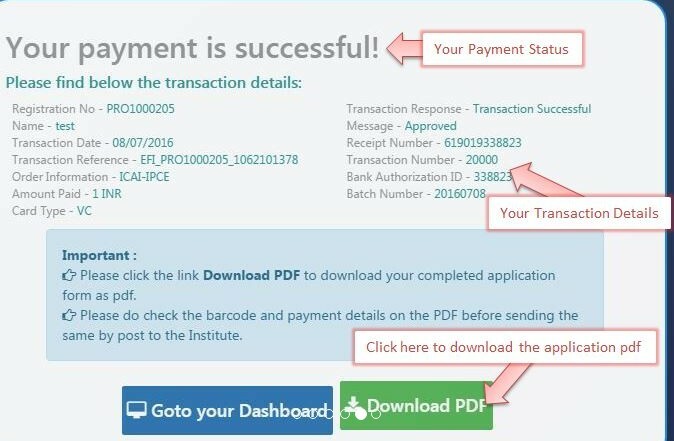 Step 5: Once your payment is successful, proceed to download PDF of the application form. Those candidates whose photograph and signatures are appearing in the PDF, while filling their exam application, need NOT submit a print out of their exam form at the office/s of ICAI. Helpline Telephone Numbers: 0120-3054 851, 3054 852, 3054 853, 3054 854, 3054 835, 4953751, 4953752, 4953753, 4953754. Helpdesk services will be available on all working days between 10am to 5pm. Students appearing for CA Foundation 2019 may note that print outs of exam application form received after 25th March, 2019 will not be entertained by the ICAI. So, to be on the safe side, students are advised to finish the online application process and send the pdf to ICAI (if required) at least 3-4 days in advance of the last date.